The festival will kickoff the evening of Friday, October 14, 2016, and continue the afternoon and evening of Saturday, October 15, 2016. The detailed schedule (subject to adjustment) is included below. All events are free and open to the public. For information about the locations and free parking, see our Getting to the Festival page. In this critique-driven workshop, accomplished poet and teacher Michael McFee will talk about some important elements of poetry writing. Drawing on submitted poems, Michael will focus on a number of things—such as titles, first lines and openings, metaphorical language, line and stanza breaks, and last lines and conclusions—that every poet wrestles with. Whether your poem is used directly in the workshop or not, you’ll benefit from attending and learning more about the essentials of making the strongest possible poem. If you’re interested in submitting something for Michael to consider using during the workshop, please send a single lyric poem of no more than one page as an attachment (.pdf, .doc, or .docx) to westendpoetryfestival@gmail.com with the subject line “poem for McFee workshop” no later than Saturday, October 8, 2016. Michael has generously offered to provide written comments on the first 20 poems received; he’ll return the marked-up poems at the end of the workshop. Be sure to include your name on your submission. While the deadline to submit a poem is past, we still encourage you to attend the workshop to learn about the essential elements of making good poems. Award-winning poet Allison Adelle Hedge Coke will read from her own work and share from her thoughts and experiences. In her most recent book, Streaming (published by Coffee House Press in 2014, longlisted for the 2015 PEN Open Book Award, and winner of the 2015 PEN Southwest Award for Poetry), she turns to her indigenous background to consider loss, memory, and the fate of the planet. Healing can be the overt subject of a poem, or healing can be the result of the poem. Poetry can work to heal the poet—think of poetry as explicit therapy, as in the work of poets Ellen Bass or John Fox. Poetry can work to heal the reader—“Poetry heals the wounds inflicted by reason,” as Novalis puts it. The poet can be a healer, if healing is her vocation. We have many great physician-poets—John Keats, William Carlos Williams, Fady Joudah, Rafael Campo. Or the poet can be a metaphorical healer, offering solace and strength to the psyche. A variety of poets participating in this panel will share poems and provide perspectives on the interplay of healing and poetry. Sign up between 12:00 and 4:30 for a chance to read a single poem, no longer than three minutes. Eat, drink, and visit with poets and poetry lovers. 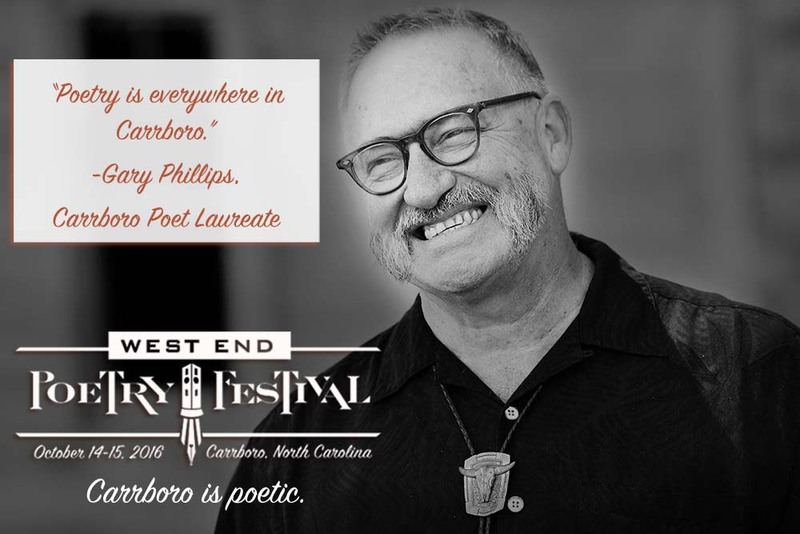 Gary Phillips, the Carrboro poet laureate (newly appointed to a two-year term starting July 1, 2016), will read briefly before accomplished poet Michael McFee closes the festival with a reading, leaving time for questions from the audience and signing books.